The childcare center will lease a 10,000-square-foot space, with an additional 4,000-square-foot outdoor play area. 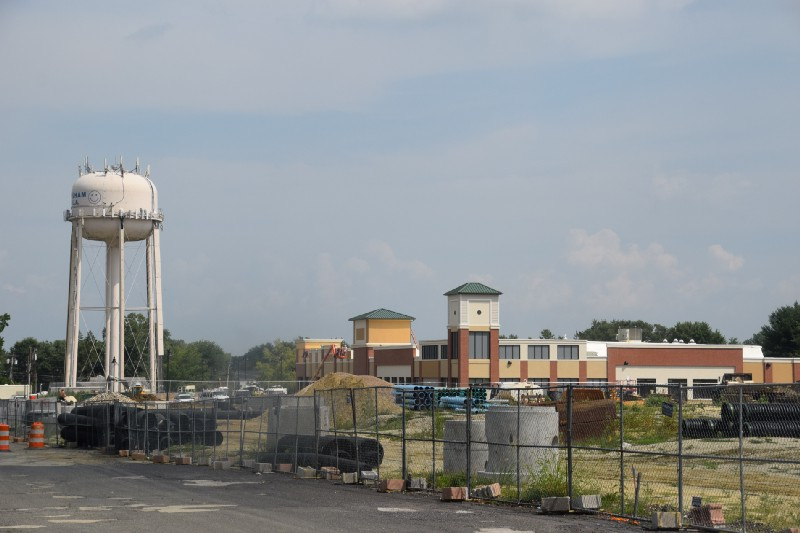 Pictured is construction as of last summer at the former Tri-Towne Plaza, now known as The Shoppes and Residences at Renaissance Square. It’s another big signing for one of Evesham’s biggest redevelopment projects, as business officials announced this week that yet another new tenant has agreed to lease a combined 14,000 square-feet of space at The Shoppes and Residences at Renaissance Square. Less than a month after announcing Evesham Mortgage had agreed to lease more than 12,000 square-feet of retail space at the mixed-use shopping center, site owner RD Management announced Children of America has agreed to lease a 10,000 square-foot space at the site, with an additional 4,000 square-foot outdoor play area at the center. Officials from RD Management described Children of America as “a leader in childcare and education,” with the group managing 65 childcare centers employing more than 2,000 staff members in New Jersey, Delaware, Illinois, Indiana, Massachusetts, Maryland, New York, North Carolina, Ohio, Pennsylvania, Virginia and Wisconsin. Richard Birdoff, principal and president of RD Management, said the addition Children of America to the site would add a valuable component to The Shoppes and Residences at Renaissance Square. No time frame was given for the opening of childcare site. In addition to Children of America and Evesham Mortgage, other retail businesses that officials have already announced for the site include Gaetano’s Pizzeria & Cheesesteaks, Pink Petal Mani Pedi, Dunkin’ Donuts, Hair Cuttery, La Scala Italian Restaurant and La Vez Mexican Restaurant. Although construction is still ongoing at the center, the TD Bank pad site that existed before construction began continues to operate, along with the site’s anchor tenant — a Virtua Medical Group medical facility that opened last summer and occupies 32,568 square feet. RD Management officials say retail tenants will also have access to the panels on a newly proposed pylon sign along Route 70, with officials estimating more than 37,000 passing cars to view the sign a day. Along with the planned retail at the $70 million redevelopment project, officials have also been approved for a potential 338 luxury apartment units, along with more retail sites and the creation of an open space park. Developers will set the park on the nearly 150-foot piece of land owned by the state Department of Transportation known as the Rockefeller Easement, which buffers the site’s parking lot from Route 70. Although the DOT wouldn’t allow retail or residential development on the land, Birdoff and Evesham officials were able to persuade the state to allow a park with trails and a pond. Once all retail, residential and recreation work at the site is complete, officials estimate the site will encompass more that 583,000 square feet. RD Management owns 21 properties in New Jersey, with more than 150 properties in its national portfolio.